AUBURN - Mrs. Jeannine Rita St. Hilaire, 85, went home to be with the Lord and her beloved late husband, sisters, brothers, and parents, early Wednesday morning, Feb. 6, 2019, at the Androscoggin Hospice House. AUBURN – Mrs. Jeannine Rita St. Hilaire, 85, went home to be with the Lord and her beloved late husband, sisters, brothers, and parents, early Wednesday morning, Feb. 6, 2019, at the Androscoggin Hospice House. Jeannine was born to George and Ida Labonte (Laliberte) in Lewiston, on March 1, 1933. She spent much of her young life helping to raise her many nieces and nephews, as she was the youngest of nine children. She graduated from St. Peter’s Elementary School and completed one year at St. Dominic Regional High School before leaving to take care of her many nieces and nephews. Besides being devoted to her family, Jeannine worked at a diner in her teens, as well as the Bates Mill. Jeannine married the love of her life, William R. “Pete” St. Hilaire, on June 29, 1953. The love that this couple shared was truly rare and inspiring to all of those who were able to witness it. Together, they owned Curtis Pharmacy in Hallowell, where Pete practiced as a pharmacist. Following the birth of their four children, Jeannine was a homemaker for much of her life, a strong woman who fiercely loved and cared for all of her family. Sadly, Pete passed away unexpectedly on March 15, 1994, leaving Jeannine a widow, at the age of 61. Jeannine was an extremely active and devout member of Holy Family Parish, in Lewiston, since 1964. She served as a Eucharistic minister at the parish, while also bringing communion to shut-ins at their homes; a proud member of the Ladies of St. Ann Sodality (named Sodalist of the Year 2004-2005); designated “Sunshine Girl” who sent cards to ill members of the church who were in hospitals or at home, while also being responsible for orchestrating a Mass at the parish for every deceased member. Jeannine was a sports enthusiast, very often found at the ice rink watching sons, Mike and Dan, play ice hockey. Jeannine was always present for her children, grandchildren, and great-grandchildren’s endeavors, whether that be on the playing fields, ice rinks or on stage in a theater. There was never an event that she would willingly miss, always acting as the biggest fan for all of her beloved family. She was the matriarch of her entire family, always the first one to start the phone chain with important news that needed to be shared, and she made sure that it was shared fast! Jeannine worked selflessly for her family, extended family, and her church for the entirety of her life. Known fondly as “Memere” by her nine grandchildren, she spent every summer babysitting her grandkids and even great-grandchildren, and the school year, bringing them back and forth to school every day. Jeannine is loved and survived by her four children, Linda and husband, Donald Cooper of Buckfield, Dan and wife, Pauline St. Hilaire of Coral Springs, Fla., Tina and husband, Dirk DeHaan of Lewiston, and Mike and wife, Sue St.,Hilaire of Lewiston. Jeannine adored her nine grandchildren who lovingly referred to her as Memere, and whose lives she was a part of, from the day that they all were born. She will be sadly missed by grandchildren Nick, Ben, Tracy, Krista, Zack, Kristofer, Heidi, Bethany, and Bobby. Memere also took pride in her great-grandchildren, Jayse, Jorden, Ava, Addison, Tyler, Lyla, Liliana, Alexa, and Wallace. Jeannine is also survived by many special nieces, nephews and cousins who all held a very special place in her heart. Jeannine was predeceased by her loving husband, Pete; sisters, Marcelle, Yvonne, Lucille, Annette and Jeannette, brothers, Dominic and Robert; special sisters-in-law, Georgette Sinclair and Yvette Greek, brother-in-law, George St. Hilaire; as well as many special friends and family members, whom Jeannine held fondly in her heart. Jeannine was fiercely protective of her family and was passionate about everything that she did in her life. She will be very sadly missed and remembered. “A golden heart stopped beating, hard working hands to rest. 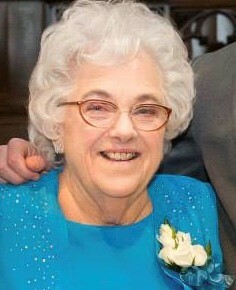 God broke our hearts to prove to us, He only takes the best.” We love you mom (Memere/Great-Mere). The family wishes to thank the incredible staff at the Androscoggin Hospice House for the outstanding, compassionate care that they showed Jeannine during the last week of her life. You are invited to offer your condolences and share fond memories with the family by visiting Jeannine’s guestbook at www.thefortingroupauburn.com.